It's may be one of the youngest wine areas in the country, but the second generation of winemakers is coming through in the Canberra region. Born into the families that first planted the vines, they're putting their personal touch on wines that are finally making people stand up and take notice across the country. While others were learning to walk or ride a bike, they were picking grapes, learning to drive tractors and making wines, long before reaching the legal drinking age. Meet the next generation of Canberra's winemakers. It was 1971 when the first grapes were planted in the Canberra region - some on the western shore of Lake George by Edgar Riek, which became Lake George Winery, and others in Murrumbateman by Dr John Kirk, which became Clonakilla. John had moved with his family to Canberra from Ireland in 1968 as a research scientist for the CSIRO. He first learnt about wine long before he could drink, put in charge of serving behind the bar and stocking the wine cellar at his family's hotel in the west of Ireland at a young age. His family bought him a book about wine, which he devoured, and which built the knowledge that later gave him an inkling vines could grow near Canberra. John's son Tim was just four when the family bought the Murrumbateman farm. "Some of my best memories of my childhood were coming out with Dad to the farm on weekends cause he was a research scientist during the week then on Saturdays and Sundays we'd head out to the farm. I'd often be in the company of my brother Jeremy, so we were kind of dad's "helpers", although I'm not sure how much help we were," he says. "I do remember cooking the sausages, that was one job I did. Otherwise we would run around chasing sheeps and making cubbies and occasionally hold something for dad as he planted a vine or banged in a post or something. But it was part of the family culture growing up that we had the farm, and wine was always on the table, and it was just part of who we were." Growing up, Tim said he, "took it for granted" and wasn't particularly interested in the wine business. He moved to Melbourne and was working as a teacher, but was always drawn back to the vineyard come school holidays. As well as helping out at Clonakilla, he explored the wineries of Victoria and got to the point where he was "completely besotted" by wine. So in 1996, he relocated back to Murrumbateman, where Tim and wife Lara have lived ever since, raising their five children. He worked as a winemaker at Clonakilla until 2007 when John retired and Tim took over the chief winemaker role. "I have to say to Dad's great credit, he let me kind of have my head pretty early and he encouraged me. He really allowed me to develop the wines in this vision of a more European French style of shiraz," says Tim. And it was these French styles which have given Clonakilla their biggest successes, particularly with the shiraz viognier, now their flagship wine. "I visited France back in 1991 and was so impressed by the wines from the northern Rhone. They were so different to what we'd seen in Australia - they had this elegance and finesse about them, more about beauty than power," says Tim. "Dad amazingly had planted viognier in the mid '80s which is this white grape which was very rare at that stage. He secured some rootlings through his connections at Charles Sturt University, and these were very feeble tiny little vines. I remember quite clearly Dad had to work very hard even to get these vines up to the wire and across, because they were very weak, and it took Dad years to get them to start bearing fruit. "In the meantime I went to France where they do this amazing thing where they blend the viognier in with the shiraz. And it all happened almost miraculously that I came back with my head full of shiraz viognier blends just as the viognier was cropping for the first time. So we started adopting some French approaches like blending the viognier into the shiraz which we did from 1992 on. And step by step Dad and I developed this new style of wine which is of course now regarded as one of the great reds of Australia." Surprisingly, Tim has no official qualifications in winemaking - he actually trained in theology and a part-time preacher. "I figure that all you need to know is what Jesus knew, if he was able to turn water into wine, and I stayed pretty close to him and it seemed to turn out pretty well," he says. "My Dad taught me winemaking but then of course I travelled and you learn as you go and you meet winermakers. I went to France many times, stealing all he best techniques you see and see what people are doing. And we incorporated a lot of those techniques into our winemaking and it's just gone from strength to strength." Along with Edgar Riek and John Kirk, Ken Helm was another pioneer of the Canberra wine district, planting the vines and establishing Helm Wines just outside of Murrumbateman in 1973. A fellow alumnus of the CSIRO, Ken is a fourth generation descendant of German vine growers, who established vineyards near Albury and Rutherglen in the 1860s. Ken and his wife Judith had three kids, and while older children Matthew and Natalie made a bit of wine and have been involved in the family business, it's youngest daughter Stephanie who became a winemaker. "I often say I had the better end of the deal because my brother and sister were there at the beginning when mum and dad were trying to start the vineyard and they had all sorts of problems to begin with and it wasn't quite as much fun," says Stephanie. "So when I came along, things were a bit more settled, Dad had a bit more time and energy to show me around and show me how to make wine." Stephanie's youngest memories are growing up on the property and helping to pick grapes, "but I don't know how much of a help I was". She made her first wine - a chardonnay in oak - at the age of nine. Then she progressed to the reds and won a trophy in 1999 for her cabernet at the Murrumbateman Cool Climate Wine Show when she was 13. "I was only the only kid at school who had a note saying that i didn't do my homework because I was putting out the nets," she laughs. While it was part of her everyday growing up, Stephanie didn't initially see it as a career. "I didn't really think much of it because it's just how I grew up, and I wanted to distance myself. I guess you kind of just think of it as it's just what your family does. And dad and mum have always been very keen on encouraging us to do other things, so I went and did arts law at ANU and didn't really think of it," she says. It wasn't until she met now-husband Ben Osborne, who wasn't particular into wine but worked as a horticulturalist, that they started spending more time at Helm Wines. "We found ourselves out here most weekends helping, and obviously helping at vintage, and I sort of went, 'oh it's actually really fun out there'." They kept helping out on weekends while keeping their day jobs in Canberra. 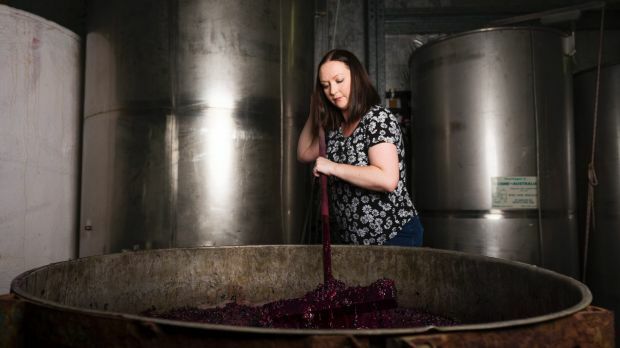 When a winery in Murrumbateman, formerly Yass Valley Wines, was put up for sale in 2014, they bought it and started their own label, The Vintner's Daughter, a nod to Stephanie's heritage. "Helm Wines is still expanding and we're still involved there, but I spose this has become our baby now, and our passion. We've been really surprised about how good everyone's been about it. I felt a lot of pressure at the beginning there, just being 'Ken Helm's daughter' and everyone's like, 'what's the wine gonna be like'?" Stephanie still has a day job in Canberra, and balances work on the vineyard with finishing a degree in wine science, while Ben works three or four days a week with his father-in-law at Helm Wines. "We're still very involved in Helm Wines and it's really good over there but dad has the final say. So we wanted The Vintner's Daughter to be something that we can do. And it's very small - we've only got three hectares of vines. We grow everything we make and that's how we want it to continue. So it's only a small lot which is enough for the two of us to manage. "But Dad's been very proud. I think that comes into part of it with him always encouraging us to do our own thing. He likes seeing us make it on our own so he's been very supportive." And now the next generation is helping out at the winery, with Stephanie and Ben's daughter Grace born 18 months ago. "She's very helpful, she wants to help with everything. She loves it - she loves going out into the vineyard, even when we just go and do grape samples and walking up and down and looking at the wildlife and playing with the dogs," says Stephanie. "Obviously I won't pressure my daughter but it'd be nice for her to grow up here and have the same sort of upbringing that I did." It was 1978 when Sue and Dave Carpenter left careers in academia - Sue as a research statistician and Dave as a physics research fellow - to plant vines in Bungendore. With three varieties - riesling, chardonnay and pinot - they launched Lark Hill Winery. A few years later, their son Chris was born. "I kind of grew up in the vineyard, I learnt to drive on the tractor and thought it was perfectly normal to be involved in harvest and vintage work," says Chris. Growing up with a family business often can send the next generation wanting to set out and forge their own path, but Chris never had any doubt it was what he wanted to do. "I think it's a very common family business story you either love it or you hate it and I just grew up with it in my blood, it was just something I loved. In fact I was firmly encouraged to explore other careers and do something else. But I can't actually remember a time when I had any other particular aspirations. It just felt natural to go straight into their footsteps." Chris has now been working full time at the winery for 15 years - after finishing school he travelled to South Australia's Penfolds to get harvest experience, but knew where he wanted to be was working at the family vineyard. He also got a bit of study under his belt, with degrees in biochemistry and wine science, but most of his experience has been hands-on at the vineyard. He helped the vineyard become certified organic in 2001, and the move towards fully organic and biodynamic farming. Six years ago, they also bought a second vineyard at Murrumbateman, which they renamed Dark Horse Vineyard, adding Shiraz, Viognier, Sangiovese, Marsanne and Rousanne grapes. Chris also led Lark Hill to be the first in the country to plant white Austrian variety gruner veltliner. "We joke about I'm the kind of person to throw ideas at a wall and see what sticks. And I think my parents being from such an academic background tend to be much more considered - if they've gone with something one way and it didn't work they won't revisit it whereas I tend to be more interested in reiteration and experimentation, so I quite like trying to work with different winemaking techniques." These days Chris lives in Canberra's north with his wife and two young daughters. "[My eldest daughter] Eliza rode on the harvester with me last vintage. They get out as much as they can, they get involved and they love it. But at this point it's just about grape juice and eating grapes". And Dave and Sue are still very much involved. "A huge amount of people ask me, 'when are your parents going to retire? Or have you replaced them?' But they retired 40 years ago out of academia. This is their retirement, but it's also their passion. So asking them to retire from this is like asking them to stop being passionate about something. It's not my place. They had as much involvement as they want to, and that's at the moment a fair bit, and they clearly still love it." Winemaking is much more recent addition for the Leyshon family, with Mallaluka Wines only launching in 2014. Founder John Leyshon had been making wines as a hobby since the late 90s, running label Little Bridge Wines with three mates as a side project, which meant his three children got a bit of a taste of life in the vines. 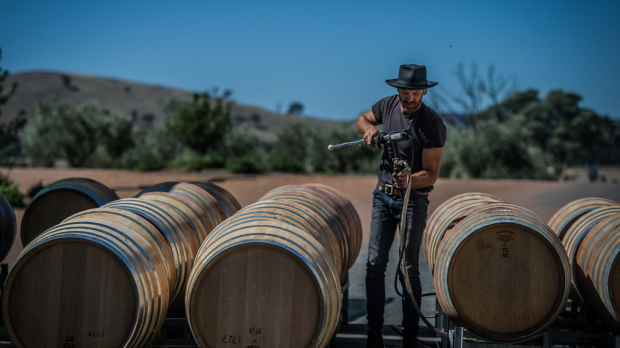 "When I was a young teenager, I'd be out helping plant the vines and prune the vines and when it was time for the winemaking, I'd be hanging around the winery," says son Sam. "But then through my mid to late 20s, without meaning to I distanced myself from it. I wasn't interested in wine at all, I never considered it a career, Dad certainly never pressured me to ever have that as a career, it wasn't a very big business at the time." Sam moved to Melbourne - a move that was meant to be a step away from the wine industry, but ironically, ended up pulling him back in. Working at a wine store, he was inspired by some of the younger producers coming through and the wines they were producing, so he decided to study wine science at university. "I loved the science part of it all but working at this store in Melbourne showed me this whole new world of interesting more experimental varieties and methods of winemaking that opened up many door ways in my head." He decided to make the move back to Yass in 2015, and secured a job working at Clonakilla, where he made his first wine. Being back in the area, he and his dad also decided to make a go of it with Mallaluka. "Dad was making all the wine then, and he just needed help. He said, 'no pressure but we might have to let go of the property, because I just can't maintain it on my own'. So I thought I reckon I'll come back and give it a go. I saw a lot of people who were desperate to own their own vineyards and have access to a winery and not everyone can do that. So I felt like I was in a really good position to take hold of something interesting." Together with his dad, they've continued to make Mallaluka's traditional range of wines, and have also added more experimental smaller batch labels. Sam Leyshon of Mallaluka wines. "I've pushed things pretty hard, I've tipped some wine in the drain, and made some interesting failures. But you've gotta try it. Naturally I am more interested, whether it be art or foods or music, I do like something a little less conventional. That's just what I've been exposed to and what I'm into. So wine is no different. I do try and push boundaries so to speak and come up with something interesting," says Sam. "And dad's an absolute legend in giving me such free reign. I've ruined some awesome fruit that he put hard work into, and he's just laughed it off. And from the start he's just like, 'look Sambo, I want you to know that if this doesn't work out it's ok, if we have to tip it out, it's ok, it's not that much'. That's what I do love about mum and dad both, they're very open minded in that way. But I do want to come up with something interesting that's not as unhinged, and maybe a little bit more sophisticated, but we're getting there. John and Sam now run Mallaluka Wines together, while they still both work day jobs. "We haven't taken the plunge to make this full time as of yet. But this is my fourth time I've done a double harvest (at Clonakilla and Mallaluka) on top of my day job, and it's taxing," he says. "The best thing about it is working with family, and having that connection with the things that you're growing and the things you're making and setting it out into the market."